File Name; Marvin F. Hinton of Biloxi, Mississippi. Notes: Biloxi is on the Gulf coast, about 60 miles west of Mobile, Alabama. I consider the 2002 "Charles Griffith" Roadblock to be a version of Double Blast. Roadblock was also the name of a Decepticon released in 1989 as one of the Ultra Pretenders. alphabetical: Road Pig << Roadblock >> Robo-J.O.E. Sunbow's Roadblock often rhymed when he spoke, and he wore his 1984 outfit through season 1 and in a few season 2 appearances (Last Hour to Doomsday, Let's Play Soldier, Sink the Montana). He did not wear a goatee and almost never wore a helmet, and the contrast of his camo colors was more pronounced than on the figure. He wore brighter orange pants, usually with no leg holsters. For most of season 2 and the Movie he wore his 1986 outfit, with a darker green vest with a brown belt and right chest strap. 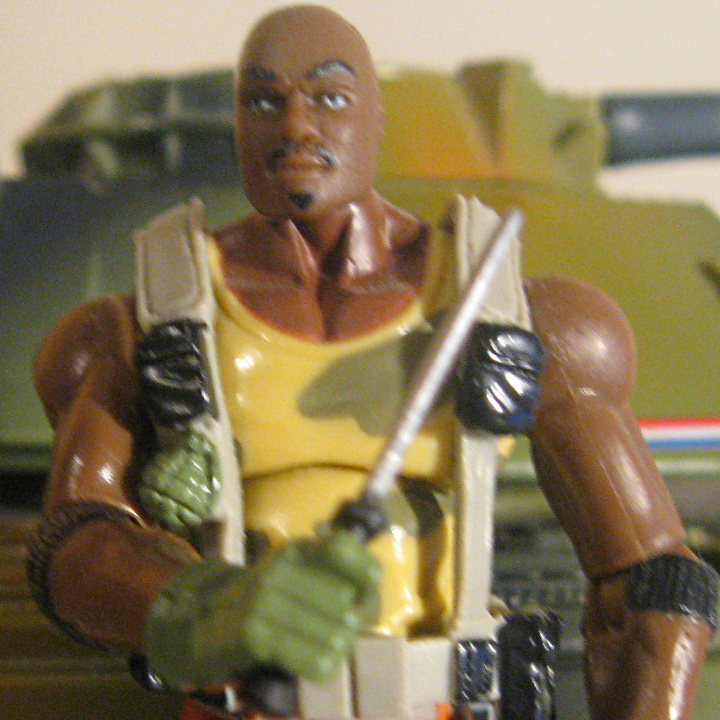 Roadblock was called by his given name Marvin in the episode Red Rocket's Glare. His 1988 outfit can just be glimpsed in the Tiger Force ad. 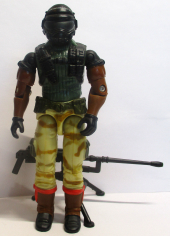 The DiC series used Roadblock's 1992 outfit. The Revenge of Cobra, Part 5 96 seconds 8 lines fighting in arena, escaping, using creeper vines to capture Cobra Cmdr. Cobra CLAWs Are Coming to Town 148 seconds 10 lines at HQ on Christmas, cooking turkey, captured, operating an A.S.P. Accessories: light green M2 Browning .50 Caliber machine gun and tripod with short legs (new), light green helmet (83 Duke's), red-brown backpack with handle and pegs for ammo box and tripod (new), red-brown rectangular ammo box (new). Roadblock's dream was to be a gourmet chef. He was working as a bouncer to earn money to attend Escoffier School in France when an army recruiter convinced him that the army could train him to be a chef. Roadblock joined but found army menus and preparation techniques too appalling. Transferred to the infantry. Qualified expert: M-2 Browning .50 cal. ; Heavy Machine Gun; all Warsaw Pact Heavy MGs; M-16; M-1911A1 Auto Pistol. "A .50 cal. Browning weighs 84 pounds. Add fifty pounds for the ammo - that's about 134 pounds of steel generating 2930 f.p.s. in muzzle velocity at a cyclic rate of 550 r.p.m. Anybody who can handle that doesn't need a machine gun to keep me away!" Toy Notes: Item #6419. Featured in the Sky Hawk commercial. Accessories: silver FN MAG L7A2 machine gun with long tripod mount and large tripod (new). "A .50 cal. Browning weighs 84 pounds. Add fifty pounds for the ammo - that's about 134 pounds of steel generating 2930 f.p.s.in muzzle velocity at a cyclic rate of 550 r.p.m. Anybody who can handle that doesn't need a machine gun to keep me away!" Accessories: dark grey machine gun and tripod (84 Roadblock's), yellow helmet with black tiger stripes (83 Duke's), light green backpack (84 Roadblock's), light green ammo box (84 Roadblock's). ROADBLOCK's dream was to be a gourmet chef. He was working as a bouncer to earn money to attend the Escoffier School in France when a recruiter convinced him that the Army could train him just as well. At boot camp, Roadblock found Army menus and preparation techniques too appalling! He remained steadfast in his goal to be a chef, but at the same time, developed a new skill - being a heavy machine gunner! 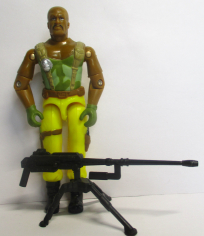 He was selected by Tiger Force because of his ability to operate a heavy machine gun, in addition he could transform simple K-rations into gourmet delicacies. "A .50 cal. Browning weighs 84 pounds. Add fifty pounds for the ammo - that's about 134 pounds of steel generating 2930 f.p.s.in muzzle velocity at a cyclic rate of 550 r.p.m, and you have one awesome machine gun! Anybody who can handle that doesn't need a machine gun to keep me away!" Recalled Accessories: black "M90 continuous-fire machine gun" with grip on very back and huge scope (new), blue spring-loaded rotor launcher/machine gun mount with black trigger (new), black spring rotor with ring around three blades (new), black "XF-45 combat knife" (new), black figure stand (common). Battle Corps Accessories: black pistol (88 Shockwave's), black submachine gun (88 Hit & Run's), black rifle (90 Bullhorn's), teal spring launcher with black trigger (93 Cross-Country's), two black spring missiles (93 Bazooka's), black figure stand (common). What can you say about a guy who totes a 134 pound machine gun as his personal weapon and who can whip up a mean crawdad stew? Not much. You just stay out of his field of fire, and ask for seconds. 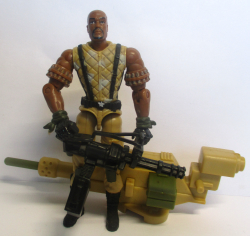 ROADBLOCK is the man who lays down the covering fire with his heavy machine gun. That means he makes the enemy keep their heads down when the G.I. Joes are advancing, as well as making them think twice about giving chase when the G.I. Joes are withdrawing! He usually leads his squad into battle while riding the G.I. Joe Patriot. Motto: "Baste a turkey every twenty minutes and change the barrel on a Ma-Deuce .50 caliber after every second belt." Toy Notes: Item #6727. The figure was first delayed and then recalled due to safety concerns about the disc launcher, and so the Battle Corps reissue is actually more common. 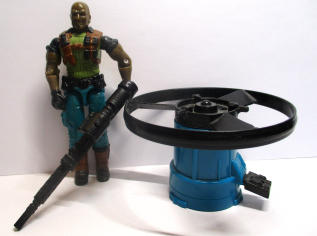 The launcher and disc are high-demand accessories; the same machine gun (in slightly lower-quality plastic), was included with Roadblocks sold in India. Reissues: Reissued in winter 1993 on a Battle Corps card along with the new Wave 1 figures. Accessories: black pistol (88 Shockwave's), black submachine gun (88 Hit & Run's), black rifle (90 Bullhorn's), teal spring launcher with black trigger (93 Cross-Country's), two black spring missiles (93 Bazooka's), black figure stand (common). Accessories: gold submachine gun (91 Tracker's), gold machine gun (91 Grunt's), gold shotgun (88 Muskrat's), dark blue spring launcher with gold trigger (93 Duke's), two gold spring missiles (93 Bazooka's), gold machete (88 Muskrat's), light blue helmet (91 Hawk's), clear red face shield (91 Hawk's), gold figure stand (common). What can you say about a guy who totes a 134-pound machine gun as his personal weapon, and who can whip up the meanest freeze-dried crawdad stew this side of the Milky Way? Not much. You just stay out of his field of fire, and ask for seconds. 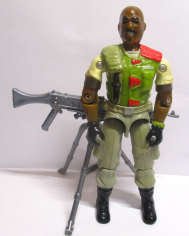 ROADBLOCK is the man who lays down cover fire when the Joes need to clear Cobra Astro Vipers off a planet's surface. "It's like scraping bugs off your windshield," Roadblock always says. "They're a hassle at first but eventually they get squished and disappear." Motto: "The only way I like Cobra is the way I like astronaut food: freeze dried!" Accessories: gold submachine gun (91 Tracker's), gold machine gun (91 Grunt's), gold shotgun (88 Muskrat's), silver spring launcher with black trigger (93 Duke's), two gold spring missiles (93 Bazooka's), gold machete (88 Muskrat's), black helmet (91 Hawk's), clear red face shield (91 Hawk's), gold figure stand (common). What can you say about a guy who totes a 134-pound machine gun as his personal weapon, and who can whip up the meanest freeze-dried crawdad stew this side of the Milky Way? Not much. You just stay out of his field of fire, and ask for seconds. 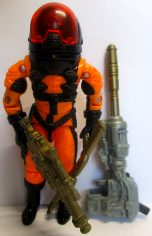 ROADBLOCK is the man who lays down cover fire when the Joes need to clear Cobra Astro Vipers off a planet's surface. "It's like scraping bugs off your windshield," Roadblock always says, "They're a hassle at first but eventually they get squished and disappear." Two-Pack Accessories: black M134 Minigun with slots for harness and ammo box with short belt (new), dark green ghillie suit (03 Cross Hair's). 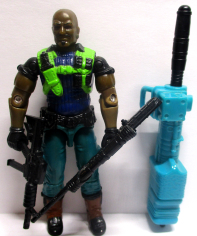 Mission Disc Accessories: black pistol (88 Shockwave's), black rifle (02 Dreadnok Ripper's), black machine gun and tripod (84 Roadblock's). A qualified expert with anything that weighs more than fifty pounds and has a full-auto switch on it, ROADBLOCK prefers the M2 "ma-deuce" .50 caliber heavy machine gun as his personal weapon. He can be totally depended on to provide all the fire suppression necessary to carry out a mission, and anyone on the team will tell you that there is nothing more comforting than seeing ROADBLOCK coming up behind you, laying down a steady protecting covering fire. ROADBLOCK is a world class chef, and equally at ease with preparing a seven course gourmet dinner as he is with laying out a staked-out field of fire for an ambush. Amiable and well-liked by his fellow team members, ROADBLOCK does not appear to have any irritating faults - other than a tendency to put a dash too much cayenne pepper in his famous crawfish stew. "You keep telling me that my ma-deuce is not a hand-held weapon, and I keep saying, maybe not for your hands." Variations: Early releases of the figure had a very short neck. 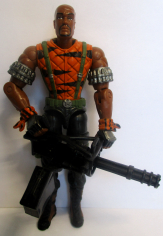 Toy Notes: Carded in a two-pack with Dreadnok Ripper. Item #57400. Reissues: Carded in April 2004 with Mission Disc #2 (Item #55334). Accessories: black minigun with harness and ammo box (03 Roadblock's), dark green ghillie suit (03 Cross Hair's). Toy Notes: Carded in a two-pack with Wild Bill. Item #5695. Accessories: black minigun with harness and ammo box (03 Roadblock's), giant tan spring missile launcher with square green trigger (new), green plain spring missile, tapered near back end (new). A qualified expert with anything that weighs more than fifty pounds and has a full-auto switch on it, ROADBLOCK prefers the M2 "Ma-Deuce" .50 caliber heavy machine gun as his personal weapon. He can be totally depended on to provide all the fire suppression necessary to carry out a mission, and anyone on the team will tell you that there is nothing more comforting than seeing ROADBLOCK coming up behind you, laying down a steady protective covering fire. ROADBLOCK is a world class chef, and equally at ease with preparing a seven course gourmet dinner as he is with laying out a staked-out field of fire for an ambush. Amiable and well-liked by his fellow team members, ROADBLOCK does not appear to have any irritating faults - other than his tendency to put a dash too much cayenne pepper in his famous crawfish stew. 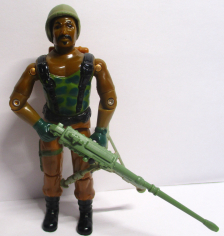 "You keep telling me that my M-Deuce is not a hand-held weapon, and I keep saying, maybe not for your hands...."
Toy Notes: Carded in a Walmart-exclusive two-pack with Cobra C.L.A.W.S.. Item #55338. This figure is considered a moderately high-demand item. Accessories: black submachine gun (84 Firefly's), black machine gun (91 Big Ben's). Toy Notes: Carded in a Toys 'R Us-exclusive set with Flint, Short-Fuze, Action Man, Tunnel Rat, and Beachhead. Item #50802. Accessories: black machine gun and tripod (84 Roadblock's), black Anti-Venom helmet (04 Barricade's), black backpack (01 Double Blast's), black figure stand (common). "You keep telling me that my Ma-Deuce is not a hand-held weapon, and I keep saying, maybe not for your hands...."
Toy Notes: Carded in a Toys 'R Us-exclusive set with Barricade, Charbroil, Sgt. Mutt, Duke, and Sgt. Lifeline. Item #53914. Accessories: black machine gun and tripod (84 Roadblock's). Toy Notes: Carded in a three-pack with Duke, Destro, and a reprint of Marvel #24. Item #61062. 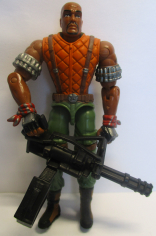 Individual Accessories: black submachine gun (89 Snake Eyes's), black rifle (03 Sand Viper's), black rifle (02 Dreadnok Ripper's). Shared Accessories: black rifle (02 Cobra B.A.T. 's), black rifle (92 Big Bear's), black rifle (02 Neo-Viper's), black cutting rifle (03 Zarana's). Toy Notes: Carded in a Toys 'R Us-exclusive set with Duke, Snake Eyes, and three versions of Infantry Division. Item #11235. The card back includes filecards Sgt. 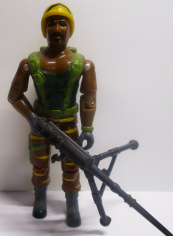 Mutt and Ace, in addition to Duke, Snake Eyes, and the Infantry Division Marksman and Infantry Specialist, but none for Roadblock, indicating last-minute changes to the set. Accessories: green M2 Browning .50 Caliber machine gun with handle on top, and tripod with long legs and small handle on crossbar (new), olive helmet with black interior (05 Breaker's), black webgear: belt and chest straps with green grenade (new), black rectangular ammo box backpack (new), long copper ammo belt with silver shells (new), black Joe figure stand. ROADBLOCK wanted to be a gourmet chef. He was working as a bouncer to earn money to attend the Escoffier School in France when an army recruiter convinced him that the army could train him to be a chef. ROADBLOCK joined but found army menus and preparation techniques too appalling. Transferred to the infantry. Qualified expert: M-2 Browning/50 cal. ; Heavy Machine Gun; all Warsaw Pact Heavy MGs; M-16; M-911A1 Auto Pistol. Toy Notes: Boxed in a set with Duke, Agent Scarlett, Snake Eyes, Gung Ho, and a sound box that played a portion of the cartoon theme music. Item #26757. Reissues: Part of December 2007's 25th Anniversary Wave 4 carded reissue assortment. Item #30413. Accessories: silver machine gun (06 Cobra S.A.W. 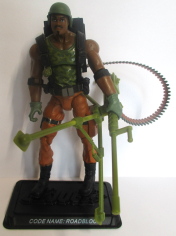 Viper's, with tripod peg), green vest with red pads and tan chest straps (new), silver tripod (84 Roadblock's), copper ammo belt with silver shells (07 Roadblock's), black Joe figure stand. 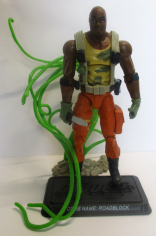 Accessories: black knife with silver blade (07 Snake Eyes's), long green strangler vines on small grey base (new), grey webgear with black pockets and green grenade (07 Roadblock's), black Joe figure stand. ROADBLOCK still finds time to cook gourmet meals, but usually he's gripping a .50 cal Browning heavy machine gun instead of a spatula. He's attended the prestigious Escoffier School in France before joining the Army and the G. I. JOE team. A courageous soldier, he'll willing [sic] sacrifice himself to save his buddies and the mission, like when he, FLINT, MUTT, and JUNKYARD were trapped in a crevice with deadly strangler vines: he stayed behind so that the others could escape. Whether he's whipping up gratinée de coquille St. Jacques or blasting COBRA TROOPERS with his "Ma Deuce," ROADBLOCK makes his point loud and clear: he's the best at anything he puts his hand to - period. "Two things I won't tolerate: someone who doesn't ask for seconds, and a COBRA who won't lay down his weapon when he sees me coming." Toy Notes: Boxed with Destro, Lady Jaye, Weather Dominator, M.A.S.S. Device generator, and The Revenge of Cobra DVD. Item #37251.